Yes, this is the famed Runt Stun Gun in Black. Super powerful and your best friend in a confrontation. One of the highest amperage stun guns available. It's a mini stun gun that's easily concealable, and virtually undetectable in the hand of a woman or man. What your attacker doesn't see will drop him like a roach who has ingested a little too much Black Flag. 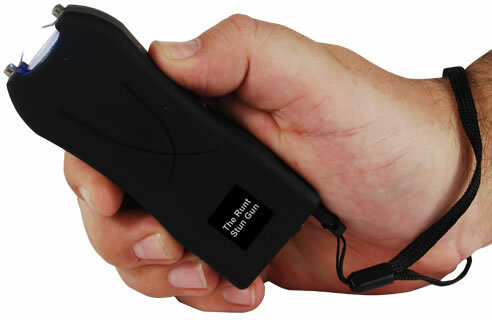 The Runt stun gun uses new cutting edge micro-technology to deliver super powered protection from a palm sized paladin. You will feel powerful armed with this weapon of choice. These Runt sized stun guns pack such immense electrical force that your attacker will be reeling in shock when you give them the surprise of their life. Highly Focused Energy - The Runt Stun Gun is Anything but Small! You can carry the Runt in your hand or pocket. If you would like to wear it like a pager it comes with a free heavy duty nylon belt loop holster. This mini stun gun is perfect for women of all ages, and of course for men as well (easy to conceal). Order the Runt today for virtually invisible protection. Available in 20M volts. Highly recommended! I just received my Runt stun gun. I like the size, fits in my hand and looks like a cell phone. It is easy to use and it gives me a sense of confidence. They do stand behind their product . They will replace any defective product , no questions asked . And their products are excellant .